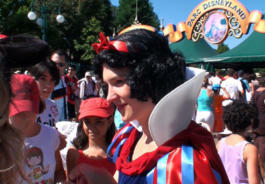 The absurd logic of the ‘real character’ and the extreme discipline of Disneyland become apparent when a real fan of Disney's Snow White* is banned from entering the park in a Snow White costume. As visitors are encouraged to dress up and a lot of costume-like merchandise is sold at the park, the full costumes are only sold for children. The Disney slogan ‘Dreams Come True’ of course means dreams produced exclusively by Disney. Anything even slightly out of control immediately evokes fear of these real, possibly dark and perverse dreams coming true. 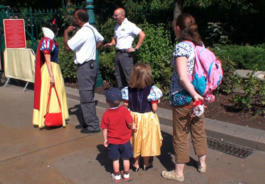 The fantasy of the innocent Snow White doing something bad is so obviously real, that the security guards and management refer to it when explaining why the visitor can’t enter the park dressed up as Snow White. *Disney’s Snow White and the Seven Dwarfs from 1937 is the first full-length cel-animated film in history; based on a fairy tale by the Brothers Grimm.